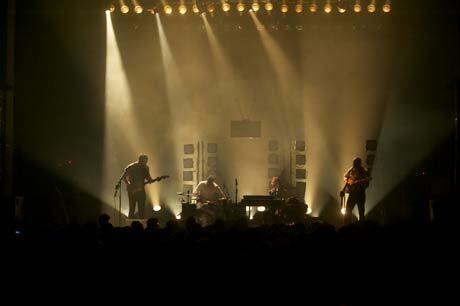 Live, Timber Timbre is a rock band, and they rock hard. The setlist, culled mostly from current Polaris shortlister Hot Dreams, infused the haunting tunes with a rocking sensibility, largely propelled by drummer Olivier Fairfield's excellent percussive backbone. Tracks like "Bring Me Simple Men" and "Curtains?!" gave off more of a punchier rock vibe than on the live recordings thanks to the guitars and keys, created a full sound led by frontman Taylor Kirk's husky, drawling voice. "Hot Dreams" was figuratively and literally the centrepiece of the night: a sleazy motel-style neon sign emblazoned with the title hung above the band, most of the setlist was culled from that record, and the titular song was aided by a rotating disco ball and saxophonist to make the most out of the woozy waltz, a definite set highlight. With the new band formation, older cuts were rearranged: the orchestral rock of Creep On Creepin' On was pared down and occasionally lost the magic of the initial versions, but songs like "Bad Ritual" and "Woman" still climaxed beautifully, and the folk of the 2009 self-titled record sounded excellent when beefed up with a full band, adding a new menacing layer to the sound. The four-song encore pulled out all the stops, from Kirk going solo on "Demon Host" to a guest spot from Tasseomancy's Romy Lightman for the fantastic "Run From Me" to one last beautiful sax spot on "Creep On Creepin' On" and a raucous closer in "Trouble Comes Knocking." It all fully encapsulated the band's foreboding nature.